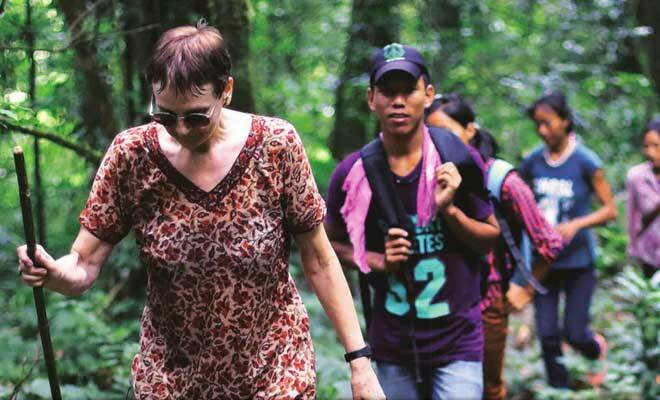 It was an arduous journey for 62-year-old Catriona Child. A flight to Guwahati from New Delhi, a train to Dimapur, a night halt and then a 15-hour drive across the sparsely inhabited Peren district of Nagaland. But as she rode through yellowing fields of tall reed encircled by bluish mountains; as she hurtled and slipped while climbing slushy mountain slopes on foot, and hitched rides on dilapidated World War II trucks and newer gypsys, on her way to the remote village of Magulong on the Manipur-Nagaland border, she was also coming home. At the entrance to the village, children stood in a line, welcoming them with a song sung to the tune of God Save the Queen. “They had been waiting for us for several hours,” says Child, who was accompanied on her journey by a group of friends and cousins. As was their tradition, the villagers offered to carry their guests in but when they protested, they tied a rope to the front bender of the gypsy and pulled it all the way to the church at the centre of the village. With that, Child had travelled through an arc of time — Magulong was where her parents Ursula Graham Bower and Colonel Frederick Nicholson Betts were married by Naga rites over 60 years ago. Her mother, the amateur anthropologist who lived for several years with the Nagas, whose life and customs she was documenting in the 1940s. Her mother, whose image was splashed on the cover of Time magazine in 1945, celebrated as the woman who led a squad of Naga warriors against the Japanese during World War II. Graham Bower, who was described by her mother to the Time magazine, as one who “never would sit still”, arrived in Assam in 1936, a disappointed woman. Having fought all her life to be sent to the best private schools in England, the 22-year-old had been denied a chance to study at Oxford because of a financial crunch at home. “She felt that her life was over. Till a friend, Alexa Macdonald, whose brother was an Imperial Civil Service officer recently posted in Manipur, invited her to join them. My grandmother, who never understood my mother’s ambitions, felt it was a good thing and that she would find a husband here. Instead my mother found the Nagas,” says Child. In the beginning, Graham Bower, a plump, academic woman, did what other white women of the Raj did — shop at a bazaar in Imphal or watch a polo match on a sunny afternoon. Then, on a trip to Kohima, she spotted the muscular Nagas for the first time, in their traditional kilts and ornaments. Graham Bower would tell Child much later that she felt a strong connection with these mysterious people, a sense that her destiny was tied with them. She began visiting Naga areas and photographing them. When she went back to London and showed her anthropologist friends the photographs, they encouraged her to return to finish the work she had started. Between 1939 and 1946, Graham Bower travelled to remote villages, helping the people with medicines and rudimentary medical care, as well as photographing them and documenting their traditions. She spent many years among the Zemi Nagas, the object of her study, in Laisong village in north Cachar, Assam. In 1942, thick in the middle of World War II, her presence and familiarity with the villagers was a strategic advantage for the British, who did not have many friends among the local, often hostile, tribes. “Maybe, because she was a woman and not an official, people began to accept her,” says Child. Graham Bower’s medical kit had become popular among residents. There were few antibiotics available, so the medicines she carried would be the only care they had for sores, fevers and infections. Over time, she developed an unshakeable bond. When the Japanese army invaded Burma in 1942 and threatened to push forward to India, she was recruited by the British to scour the jungles for the enemy. Bower mobilised the Nagas against the Japanese, placing herself at the head of a formidable band of 150 warriors, armed with ancient muzzle-loading guns. She herself would carry two sten guns. They came to be known as the Bower Force, for rescuing wounded Allied pilots and ambushing enemy missions. It was in the hills that she met Lt Col Frederick Nicholson Betts, a fellow adventurer, who she married in 1945. The newly-married couple set off toward Magulong a year later to meet the tribes in “Manipur State, outside British India and 30 miles off across forbidding hills”. First down into Jiri valley, over a steep hill, climbing over Maovam in lashing stinging rain and running down hills to finally reach a camp where the headman of Magulong, Khutuing, was waiting for them. He was carrying a ge-ze — a human hair-tufted shield and two long strands of human hair in his two ear lobes — a sign that he had taken the head of a Kuki. It was from Khutuing that Graham Bower learnt the headhunter’s war cry. “My mother really loved them, as Magulong was a warlike village, very much like Khonoma, where the Angami (tribe) lived,” Child says. In her 1952 book, Naga Path, an account of her life in the hills, Graham Bower writes of her second wedding in this village. “Tim and I had been married, the village knew, by the sahib’s laws and rites. But there ought to be more. It was right that I, who was a Zemi, should also be married by tribal rites as well — the only rites that the Zemi recognised. Magulong, therefore, proposed to see it done.” Not only had the Zemi accepted Graham Bower as one of their own, but she had also started dreaming in their language, believing herself to be one of them, says Child. For the ceremony, Khutuing adopted Graham Bower as his daughter and another family of warriors adopted Betts. There was singing and dancing and drinking till the early hours of the morning. A villager stumbled upon a bear in the middle of a field and speared it. He said he had killed it on behalf of Betts, in honour of his bride Asaipui, or the queen, as she was known by the Zemi. Rimzam was six when Graham Bower first came to Magulong village, now in Manipur’s Tamenglong district. “We had never seen a white person before and were frightened. She had different skin, hair, eyes, ears. She was so big! One of her thighs was the same size as a child. We all ran away. Then she took her gramophone to a small knoll in the middle of the village. There she started playing music. We went up to the knoll and looked around for the person singing the song. But there was no singer. Only a box from which these songs emanated in a strange language. One of the gaon budas (village elders) warned us. He told us not to listen to these songs as they would attract us and convert us to a strange religion,” recalls Rimzam. Once there was an old man who had eight sons, and he got wives for all of them. Now the old man had a fine necklace, very valuable and very heavy, and all the wives wanted it. That night he went secretly and slipped an egg into each woman’s dhan-pounder, and when first thing in the morning the women got up and began pounding furiously in order to be first with the zu, the eggs smashed and the more they pounded the worse was the mess. The youngest of all, however, stopped to clean out her dhan-pounder before she began, and found the egg, which she took and showed to her father-in-law. Off went all the wives and cut quantities of wood, but the youngest girl only pulled off bark and took that back. The others put their wood on the fire, but the logs were full of sap and refused to burn, and clouds of smoke filled the house; but the girl put the bark on carefully, bit by bit, and it burned with a bright, clear flame and the old man was warm. Then the old man said: “you are short-sighted and afflicted and greatly to be pitied, and so I shall give you the necklace.” And he took it off and put it over her head. LATER VERSION: Then the old man said: “there is no huluk, so where could you see it?” and he took off the necklace and put it over her head. (Extracted from UG Bower N.I., July 1940). At Bara Nenglo one of my Tangkhul servants caught a bee and declared he was going to tie a hair to it and send it to the girl he was shortly going home to marry. Namkia exclaimed that it was an old, old Zemi custom, and here was another Naga from a country they had never even seen using it in the middle of the same road. Surely indeed it was true that all the Nagas were one people and all came from the same place! He was much struck with it and embroidered on the theme for some time. Once upon a time there was a girl, an orphan, who got herself into trouble with one of the young men of the village. Her guardians were furious and constantly abused her, and told her to go alone to the jhums, which was very dangerous as there were headhunters about. That evening she went as usual to the dekachang and her lover Nkiqui came to her. (Original: That evening she took her bedding and went to the dekachang to sleep.) She told him all her troubles and what her guardians had said. “Why?” said the girl. “If one dies, it is no great loss; if two die, then it’s a great pity.” But Nkiqui insisted. That same morning the girl left for the furthest jhum, which she had been told to light. Nkiqui watched, and followed her, and they met in the path and went on together. She first and he following her. As soon as they saw the girl the ambushing headhunters leapt out of the jungle, but Nkiqui went between her and them, and so formidable did he look that they dared not come nearer, but kept their distance. In this way Nkiqui and the girl went right down to the furthest jhum. When they reached it, Nkiqui said: “Light the fire.” The girl tried to light it, but it would not start; and Nkiqui kept on guard with his spear and shield the whole time, shouting and threatening. “Come,” he said to the girl at last. “You take the spear and shield and the enemy will take you for me; I’ll light the fire.” Nkiqui went to light the fire, but the enemy rushed, cut down the girl, and took her head. Then Nkiqui, weeping, took up her body and carried it back to the village, and went to her guardians’ house. “Apao, anai,” (He addressed his sweetheart’s guardians as “Apao, anai”, the address used for wife’s parents.) he said. “Did you want to see her like this? Look now at your daughter. Is it pleasant?” He left the body and went away. Then Nkiqui asked where the man drew water. “Oh,” they said. “He doesn’t take it from the same place as we do for fear of Nkiqui. He goes elsewhere,” and they told him the place. “When do they fetch water?” said Nkiqui. The next day Nkiqui left the village and went to that spring with the little boy, and waited. Then the girl came for water. Now Nkiqui had made a little spear of bamboo for the boy, and he told him to strike first. Then Nkiqui killed her, and cut off her head and shoulders as far as the breasts, as the others had done to his girl. All the villagers turned out in great anger and excitement and pursued him, but Nkiqui, carrying the head and little boy, evaded them in the jungle and came safely home. Ever afterwards Nkiqui’s thoughts were only of his dead sweetheart, and he used often to sleep on her grave and talk with her in his dreams. In the daytime he used to eat there, and afterwards sleep. One day when he did this a hen came and ate out of his chunga. An old woman hurried to stop it but only scared the hen, which upset the cup with a clatter. Nkiqui woke and was very angry, because he had been talking with the girl and had been interrupted; so he abused the old woman, threatening to kill her. Many, many, many years ago a young man and a girl fell in love with each other, but his parents said “We will not pay for her” and hers said: “we will not give her.” So the young man and the girl met and discussed what they should do; and they agreed that as their parents forbade them to marry they would go away and die together. They went away stealthily into the jungle and climbed to the top of a very high cliff, and there they each took hold of a lock of their hair and tied it firmly to the other’s, so that they would fall together; but the young man was suddenly afraid at the last minute, and taking scissors he cut his hair, and the girl fell alone and was killed. “Scissors.” Both Namkia and Gumtuing used the word and action, but the instrument was presumably a knife (or dao – N’s suggestion). As the young man was going back to the village sore at heart, a black bird (which was really a spirit) began to call out and abuse him. “What sort of man are you? You’re a coward, you’re a coward! Your girl is dead and you were afraid to die too!” And it went on abusing him in the same strain. The young man was very troubled and thought to himself: “if this bird knows all about it and abuses me, what shall I do when I go to the village? Everybody will have heard the story, and I shall know nothing but shame. It is far better to go back and die.” So he turned and went back to the cliff and flung himself over, and was killed beside the girl. From the spot where they died two flowers sprang up side by side, but hers was a little longer than his; had he died at the same time they would have been of one height. We have a song about these two people, a very long song. They did not make any of it themselves, but the bird told another man, and he made it up, a long, long time ago. All the villages round here know that song. I used to know the name of the man who made it, but I have forgotten. The old men will know; I will ask. Namkia stated that as a general rule girls are much more apt to go through with a suicide. Boys lose their nerve and are apt to think that “there are lots of good fish in the sea”, but a girl in despair will go straight off and do it. From Hindustani, immediately after close of conversation. Informant: NAMKIA of Impao (Zemi). Discussing above with Namkia, Gumtuing of Nenglo and Laisong Matai, it appeared that the lovers leapt into a pool and not off a cliff, but otherwise the story was the same till the end, when the flowers came up crooked (crossed) because the lovers went in independently and not side by side. (The discussion was vigorously illustrated by Gumtuing preparing to leap into a forest pool with his arm round Namkia’s shoulders). Nobody could remember the song-maker’s name.